Previous TaleTown Story: How Eggs Fertilize? "Do all birds hatch in 21 days?" asked Josh. "No," said Rosh, "The hatching times vary in different bird species." "For chickens it is 21 days, 30-32 for geese, 28 for turkeys, 18 for doves and 42 for ostriches etc." "This time can also increase or decrease with changes in incubation temperature." "Newly hatched chicks need water and warmth immediately. Their yolk sac has enough food for 2-3 days. After that the chick needs to eat to survive." "When a hen sits on a clutch," asked Josh, "do they all hatch at once or one by one in the order in which they were first laid?" "It depends on when she begins sitting on them," said Rosh, "and the temperatures they each have the benefit of while underneath her." "If fertile and infertile eggs look the same," asked Josh, "how can you tell the difference? You could be eating the wrong one by mistake." "You can't tell the difference," said Rosh, "Fertile eggs have remnants of the male's sperm and some embryonic cells." "The proportion of these to the total egg is so small that it is impossible to detect even chemical differences between fertile and infertile eggs." "If a fertilized egg is stored inside the fridge, the embryo no longer undergoes any change or development. Eating them does no harm to you." 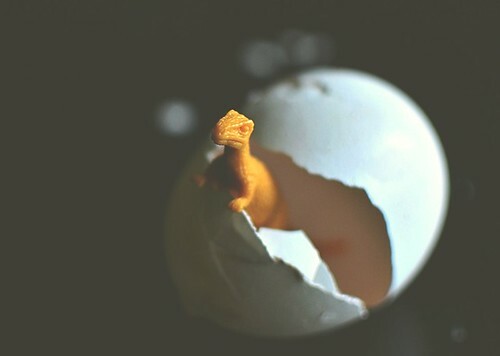 "In fact, a Balut is a developing duck embryo that is boiled alive and eaten in shell as a culinary delicacy in China and many Southeast Asian countries like Philippines, Laos, Vietnam and Cambodia." "But it is okay to have your own preferences in eating. So long as you don't look down upon others for their eating preferences." "Are fertile eggs more nutritious than infertile ones?" Josh asked. "I've read no scientific evidence so far," said Rosh, "which says that fertile eggs are nutritionally superior to infertile ones, or otherwise." "Why are some eggs white, Pa", Josh asked, "while others are colored?" "The hen's breed determines the colour of its eggshell," Rosh answered, "Hens with white feathers and ear lobes are said to lay white eggs, while hens with red feathers and ear lobes said to lay brown eggs." "Regardless of the eggshell pigment, egg white (albumen) in all eggs is clear when raw. It only becomes white in colour when beaten or cooked. Yolk colour, on the other hand, depends solely on the hen's diet. Artificial additives to enhance yolk colour are not permitted in most countries." "If a hen eats lots of yellow-orange plant pigments (xanthophylls), these give yolk a bright yellow or golden colour to the raw yolk. Hens eating corn based mashes lay eggs with medium yellow yolks, while those eating wheat or barley lay lighter-coloured yolks. A colorless diet can produce an almost colorless yolk." "Yolk is where an embryo is formed in a fertilized egg. Yolk makes up about a third (33%) of the liquid weight of the egg. It contains all of the fat in the egg and a little less than half of the protein. It also has approximately 75% of the calories contained in an egg." "With the exception of riboflavin and niacin, the yolk contains more of the egg's vitamins than the white. All of the egg's vitamins A, D and E are in the yolk. The yolk also contains more phosphorus, manganese, iron, iodine, copper, and calcium than the white, and it contains all of the zinc." "I once saw two yolks in an egg, Pa," Josh went off on a tangent. "Yeah, that can happen," Rosh explained, "Double-yolkers are created when a hen releases two yolks at the same time. This is quite common in young hens whose cycles may not be perfectly synchronised." "Older hens will sometimes produce a double-yolker in an extra-large egg. Occasionally a hen will produce double-yolker eggs throughout her egg-laying career. It is rare, but not unusual, for a young hen to produce an egg with no yolk at all too." "What freaks out people though, is when they see small blood spots on an egg yolk. These are caused by the rupture of a blood vessel on the yolk surface during egg formation." "Less than 1% of all eggs produced have blood spots, and they are normally removed during the candling, grading and selection process." "The egg can be eaten as normal or the spot can be removed with the tip of a knife. The tiny red spots do not indicate a fertilised egg." "Interestingly, hens don't lay perfect eggs all the time, like the ones you see in shops. In real life, they can produce some real oddities. You could look at those eggs and wonder what scared the egg out of her."